The picture postcard town of Dartmouth offers a couple of walks around the mouth of the River Dart which lead to stunning views and peace and quiet. On the Dartmouth side of the river, you can walk up to the mouth of the river, around a mile is distance, to Dartmouth Castle which is free to visit for English Heritage members. All the way out and back, there is plenty of river traffic to spot, from ferries to leisure craft including the occasional superyacht or cruise liner. 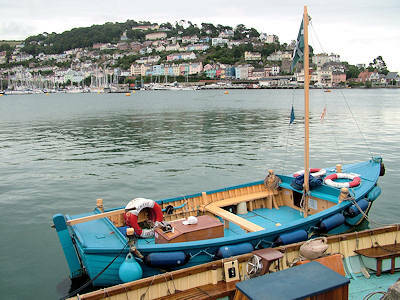 Or take the foot ferry (around £1 each way) to the other side of the river and Kingswear. From this peaceful small village, head up to the mouth of the River Dart where this side of the river offers a different walk; quiet and away from the crowds. Forming part of the South West Coast Path, again there are plenty of vantage points to view the river traffic leading to to photo opportunities of Dartmouth Castle and the coastline. Back in Dartmouth, the town quay is a popular spot, again for relaxing and watching the busy river traffic and steam train arriving into Kingswear across the water. It is also popular for ‘crabbing’ where children can dangle a line over the quay edge. Simple buy a bucket line and some bait from one of the shops in town.